John Robbins is the author of the international bestseller Diet For A New America: How Your Food Choices Affect Your Health, Happiness, and the Future of Life on Earth. The New Good Life: Living Better Than Ever in an Age of Less. Reclaiming Our Health: Exploding the Medical Myth and Embracing the Source of True Healing. John’s work has been the subject of cover stories and feature articles in The San Francisco Chronicle, The Los Angeles Times, Chicago Life, The Washington Post, The New York Times, The Philadelphia Inquirer, and many of the nation’s other major newspapers and magazines. His life and work have also been featured in an hour long PBS special titled Diet For A New America. Considered by many to be one of the most eloquent and powerful spokespersons in the world for a sane, ethical and sustainable future, John has been a featured and keynote speaker at major conferences sponsored by Physicians for Social Responsibility, Beyond War, Oxfam, the Sierra Club, the Humane Society of the United States, the United Nations Environmental Program, UNICEF, and many other organizations dedicated to creating a healthy, just, and sustainable way of life. He is the recipient of the Rachel Carson Award, the Albert Schweitzer Humanitarian Award, the Peace Abbey’s Courage of Conscience Award, and lifetime achievement awards from groups including Green America. The widespread media attention he has received has included numerous appearances on national shows including Oprah, Donahue and Geraldo. When John spoke at the United Nations, he received a standing ovation. John is the Co-Founder and President of the Food Revolution Network. The Food Revolution Network is committed to healthy, sustainable, humane, and conscious food for all. Guided by John and Ocean Robbins, with more than 600,000 members and with the collaboration of many of the top food revolutionary leaders of our times, the Food Revolution Network aims to empower individuals, build community, and transform food systems to support healthy people and a healthy planet. John has served on the Boards of many non-profit groups working toward a thriving, just, and sustainable way of life. 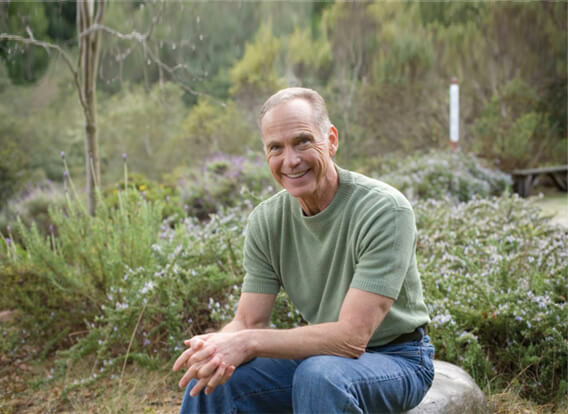 He is the Founder and Board Chair Emeritus of EarthSave International (earthsave.org), an organization dedicated to healthy food choices, preservation of the environment, and a more compassionate world, and was formerly the Board Chair of YES! (yesworld.org), which educates, inspires and empowers young leaders to take positive action for all life on Earth.